The 2017 Developer Conference attracted almost 300 delegates ranging from CTO’s, founders, engineers to recent graduates, our presentations catered for every level running on a scale of kinda techie – techie – very techie. Delegates could dip into presentations on security, AI/robotics, platforms and data with speakers drawn from both academia and industry. Rupert Whitehead, Google – What’s Google doing with machine learning? Mike Ritchie, 13coders – Software craft for small devices. Our half day Leadership Forum was based around the theme ‘Sometimes you just need an idea’ and was focussed on ideas to build your team, grow your business through active marketing and finally finding the capital to do it. Greg Mesch, CEO of CityFibre delivered the opening keynote for the Forum. He emphasised the need for companies and founders to focus, create your idea and then build the story around it. Throughout his presentation he emphasised City Fibre’s vision. “We don’t talk digging up roads to lay cable,” he said. 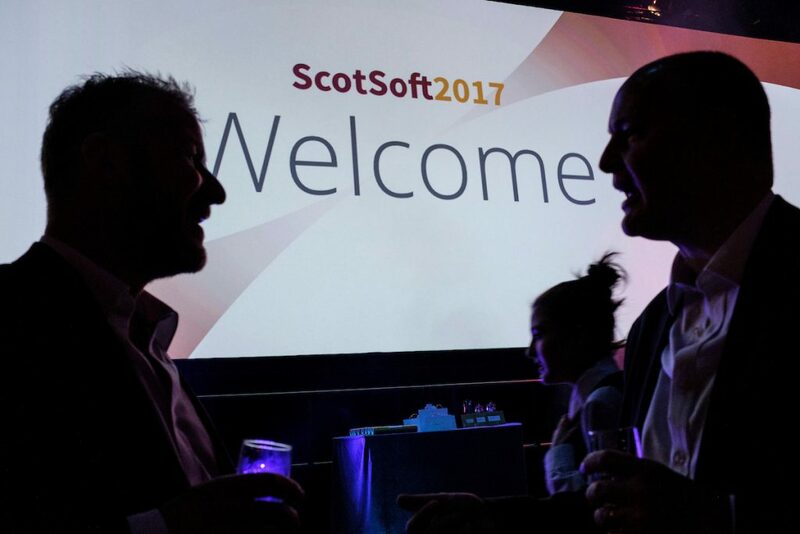 “We talk increasing a city’s GDP and GVA by 1% every year for the next decade.” While perception of opportunities in the fibre infrastructure sector may appear limited to some, Mesch told the ScotSoft audience that a market with “a fat incumbent and no competition” was a huge opportunity. During the ‘teams’ presentation we heard from Frances Sneddon from leading data driven company Simul8 and John Brown, who had recently joined automotive giant Arnold Clark as CIO and spoke about his journey to build an award winning customer focussed team. David Sneddon of Scottish Equity Partners and Ed Molyneux of FreeAgent then both gave their views on the best way to build your capital and grow your business to be world leading. Molyneux busted several myths about financing for tech companies, pointing out that the goal should not necessarily be to become the next ‘tech unicorn’ and that the goals of the VC company may not match the goals of the company they’ve invested in. Skyscanner’s Douglas Cook then spoke on growth hacking. He made a case for a lean, agile approach to marketing in which teams are given high level goals and the autonomy to approach different markets, segments and channels more effectively. This session also included John Bernard of Dexcom (ex Mozilla Head of Marketing), who spoke of his experiences growing a global business from Scotland, and highlighted the often forgotten support that is available from both Scottish Enterprise and the Scottish Government. 600 people joined us for dinner in the evening to celebrate the future of our industry at our Young Software Engineer Awards presentation. For the first time, four talented women swept the board and won all four prizes which recognise outstanding technical talent among undergraduates studying in Scotland. Gala Malbasic, of the University of St Andrews, claimed first prize at the Young Software Engineer of the Year awards, for an innovative project using sensors to replace complex keyboard sequences with gestures, using the whole surface of a laptop or tablet. Second place was won by Orisa Ngampakdeepanich from the University of Edinburgh for her project developing an app to stimulate play-based learning for children with autism spectrum condition. Irina Camilleri from the University of Strathclyde won third place with an innovative mapping technique for cyclists using sensor based crowd sourced data. The Leidos Software Engineering Project Award went to Amy Parent from the University of Abertay for developing a reusable technology system for high-altitude balloon missions used by meteorologists and researchers.